I went along to the public presentation of the developer’s plans for King’s Stables Road on Wednesday (17th June) and to be fair the model they had on display showed very clearly what was intended. Unfortunately however that was 250 student flats, a 130 bed hotel that they are hoping will be better than a budget hotel, an “arts cafe” and some artisan studios with more flats above. The courtyard previously assigned to the hotel in an article I’d read is up for discussion. 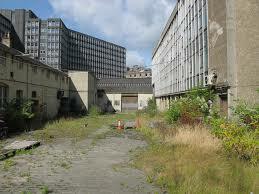 So where have Peveril the developers found that extra 5 million pounds they offered more than anybody else. Well the two storey building at the back of the courtyard will be an extension of the hotel whereas in other plans all the ground floor was dedicated to the arts. The arts cafe which others sensibly allocated as an arts/retail/cafe space with no commercial rent due will now be run commercially. Other than that is is hard to see were they are finding all the extra value. Expert advice I received said that the space allocated for studios was really too small and better uses could be found though “artisan studios” of course makes things sound better. Arts organisations have been asked to submit ideas and I’ve no doubt some will sell their souls to the developers rather than explain what could have been. The developers would certainly be better off trying to identify a really good arts leaning cafe than turn to arts organisations but off course that wouldn’t look good with the council. As for making the place an attraction outwith the “arts complex” that seems to have gone completely out of the window. Given the council’s constant message to me that credibility and deliverability were all important what is most surprising is every element of the developer’s plan simply consists of them asking somebody else to identify what to do. Their plans consist of nothing but blank pieces of paper with headlines written on. “Student Flats”, “Hotel”, “Arts Complex”. Certainly the idea that this site would be part of an arts hub spreading out to the Usher Hall, Filmhouse, Art College etc has gone. It is a huge blow to the Grassmarket with its well documented footfall problems and a lost opportunity that only makes sense financially and in the very short term. Even then that assumes the developers can get through planning and that seems impossible if they are held to the original brief by the council’s planners. Make no mistake Peveril have simply done their job securing the site for student flats and a hotel, it was up to Edinburgh Council to make the correct decision given their own brief which so clearly understood the problems faced and what was needed. 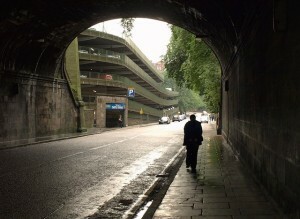 There were hopes that the car park in King’s Stables Road would be demolished one day and the transformation of the road complete but for now with the current plans for King’s Stables Road I can’t see any light at the end of the tunnel.